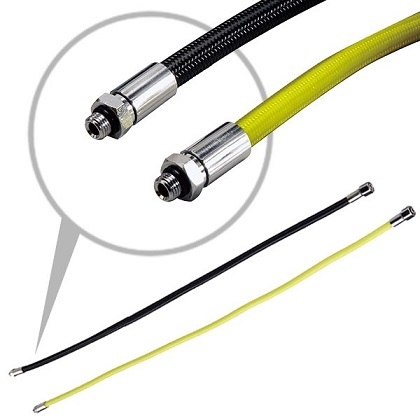 Hoses with special PE-fibre braided exterior, which not only reduces weight, but the finishing also gives the better abrasion protection than conventional rubber hose. More flexibility and smaller bending radius means more comfortable hose orientation and can continue supplying gas even when in a knot. Max. working pressure @ 86 BAR / 1250psi. Burst pressure @ 344 BAR / 5000psi.